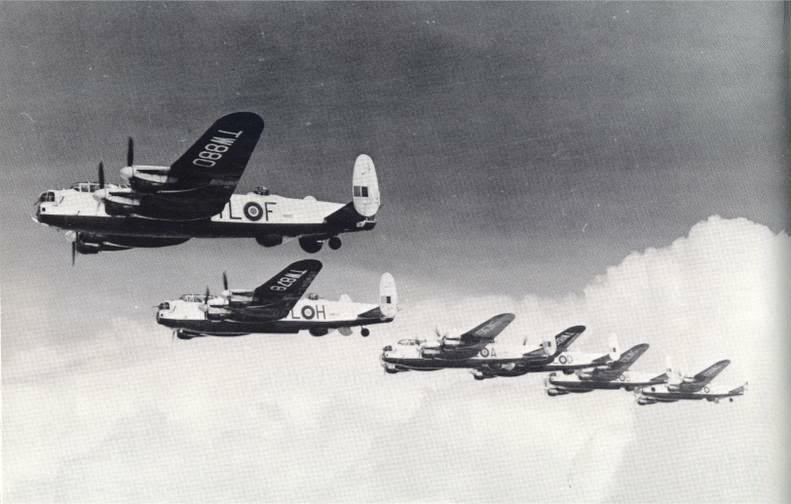 The RAF 35 Squadron returned en route to Britain via Gander Airport in the summer of 1946; this Goodwill visit ended with the unfortunate death of 4 Civilians. The well-known Gander historian, Frank Tibbo, compiled an excellent article on the subject in October 2004 for the Gander Beacon. This article was based primarily on reports from people who had in some way been involved in the landing incident at the time. The Squadron Aircraft departed Mitchel Field on the 22nd August 1946 for Gander where there was further routine Maintenance Work carried out for the long haul home. On the 23rd August 1946 ‘A’ Flight led by Wing Commander Alan John Laird Craig (Lancaster TW880) departed for Lagens, in the Azores and then on the 25th flew on to St Mawgan in Cornwall. Gander Airport Runways originally consisting of 3 Strips, 4,800ft long by 600ft wide, had been extended during the last year of the War to take care of heavier wear Transport Airships then being brought into service. This expansion had proved invaluable to the Transatlantic Airlines of that day. The Main Runway, known as the No.3 Strip, was now 1200ft wide & 6,000 ft long. Light Sports Planes could land very comfortably across its width. On the 23rd August ‘A’ Flight departed for Lagens and then on the 25th left for St Mawgan. Group Captain R C M Collard left Lagens in the Avro York Aircraft on the 27th and arrived at St Mawgans on the morning of the 28th August. He forwarded details of the proposed Reception for the 35 Squadron at Graveley on the 29th or 30th August subject to Weather conditions. Various VIP’s, Press & Film Representatives had to be assembled and a Luncheon arranged for the Personnel. Commitments for the imminent 35 Squadron – Battle of Britain Commemoration Fly-Past on the 14th September 1946 was also on the Agenda. Flight Lieutenant Stockwell arrived at Long Beach from Mitchel Field, NYC in Lancaster TL-R having followed the Commander in Chief, Sir Norman Bottomley’s Route as ‘Back-up Aircraft‘ from Mitchel Field via Dayton & Kelly Field, San Antonio, Texas. Also on the 25th of August 1946, ‘B’ Flight took off from Gander for the Return Trip via Lagens. The Squadron departed at Night (TL-Q PA414 took off at 23.35 hrs) and unfortunately, there was an incident that involved Civilian Fatalities. Lancaster TL-R (TW870), now being piloted by F/L Pete Stockwell, who had to return to Gander after only 20mins in the Air as he had problems with his DR compass. He was cleared to land but mistook 2 Directional Green Lights which marked the leeward end of the Runway for Glide Path Indicators. As a result, the Aircraft bounced on the raised road which was parallel to and only 20 yards from the Leeward end of the Runway. It was also marked with Red Lights as a Prohibited Area but there were some Civilians standing there. The Aircraft’s Starboard wheel hit some of them, killing 3 men, 1 woman & injuring another male. The Lancaster was damaged and had to remain at Gander. On investigation, Stockwell was exonerated of all blame (source mostly Alan Cooper). Note: 8 Aircraft took off and F/O John Robinson was the intended Pilot of TL-R TW870 during the US Tour, he had clearly swapped Aircraft with F/Lt Pete Stockwell at Mitchel Field. This was a very important instrument, because, not only was it a very good Compass, it provided Directional Sensor to the API Mk lV Auto-pilot, Mk XIV Bomb Sight and H2S (Mapping Radar). The Master Unit was a gimbal-mounted cylinder near the rear Door of the Lancaster, and was a combination Magnetic-Gyro device: it was not subject to acceleration as was the purely Magnetic Compass, deviation was eliminated, and, applying variation to a compensating unit at the Navigator’s Station allowed the Navigator to work in True Headings. It drove repeaters at the Navigator’s & Bomb-Aimer’s Stations, with the Pilot’s Repeater being the larger of the 2 Instruments mounted on the Instrument Coaming. (The other was a repeater from the Loop Aerial to allow the Pilot to ‘home’ on a Radio Beacon. A group of people had gathered near the end of Runway 14, watching a Squadron of Military Aircraft depart. Some of the people were on their way home from the United Church Evening Service. Fifteen-year-old Trixie Burton (now Trixie Smith of Cotton Street, Gander), was holding the hand of her friend, 21-year-old, Isola Clarke. They were looking towards the Runway End. They noticed nothing approaching from behind them – no noise, no gushing of wind, no Aircraft Engines – nothing! Then, suddenly, Miss Clarke was struck from behind by the landing wheel of the large Lancaster and killed instantly. It was Dark and the Controllers in the Tower didn’t realise what had happened. They saw the Aircraft brake sharply & perform, what appeared to be, a Ground Loop. A Ground Loop is an uncontrolled turn of approximately 180° (owing to Damage to the Undercarriage). The Control Tower called the Aircraft several times but received no Reply. The Lancaster Aircraft, Registration No.TW870, – landed at 23.59 GMT. Three other people were also killed. They were Raymond Parsons, 20, who had just completed 2 years of pre-Med at Memorial College, Cyril Brazil, 27, & 57-year-old Stanley Rideout, all from St John’s. William J Mcdonald of St Mary’s was among several others who were injured. None of the people gathered around had heard or seen any indication of the approaching disaster. The fact that they were unaware can be partly explained by the fact that Aircraft has to land into the Wind, i.e. facing the Wind. The people who were standing near the end of Runway 14 watching Aircraft departing from that Runway meant that the Wind was blowing toward their faces. They would focus on the Aircraft noises in front of them but not anything behind them. Something else that added to the cause of the Accident was the fact the Aircraft did not use its Landing Lights. This may have been because the Crew was too occupied to turn them on or maybe as a result of the established habit of the Night-Flying Pathfinder Squadron during the War. Those Aircraft regularly landed and took-off without the use of their Landing Lights. Leo Fowler of Fraser Road, Gander, was the Ambulance Driver for the Sir Frederick Banting Memorial Hospital. He remembers vividly the carnage of dead & broken bodies. It was his job to carry the injured and the dead to the Hospital. One of the most difficult things to accomplish was to find someone with the fortitude to help him carry the Stretcher containing the Body Parts. 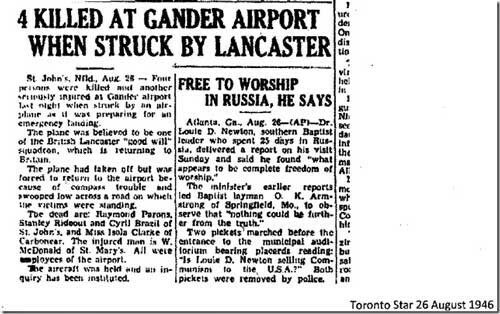 The Accident was reported to Sgt Clarke, who was in charge of the Gander Branch of the Newfoundland Constabulary. He ordered Airport Officials to close the Runway pending an Investigation. A Magisterial Inquiry, presided over by the late Beaton J Abbott, was conducted but the results of the Inquiry were never made Public by the Government of the Day. The Lancaster Bomber was placed in Hangar 8, located on the South-side of Runway 14. Hangar 8 was located approximately where the International Terminal is now. It is believed that the Aircraft was stored because of the fact that it could have been needed in the subsequent Accident Enquiry Investigation. The Hanger was not secured and the Aircraft was copiously vandalised & stripped of everything that could be moved – even down to the Rudder Cables. In 1950, the Aircraft was purchased by a Canadian Company headed by Doug Siple, a Trans Canada Airlines Pilot. That company also bought the 1,000s of Aircraft Parts that had been stored in the Bomb Shelters around the Airport. Dave Lance, a Mechanic with Trans Canada Airlines, was one of the people contracted to make the Aircraft Airworthy. Mr Lance later took Pilot Training and flew with Trans Canada Airlines for many years. Eric Wicks, a Radio Technician with the Newfoundland Government, was part of the Team that worked on the Aircraft to get it ready to fly. Mr Lance & Mr Wicks had to find the smallest man in Gander to crawl back through the Tail of the Aircraft in order to replace the Rudder Cables. After it was made Airworthy, it was ferried to Montreal. The Lancaster was put to work in a Civilian Role to Transport Freight to Northern Canada. Shortly after that it was converted to a Fuel tanker and operated out of Seven Islands. 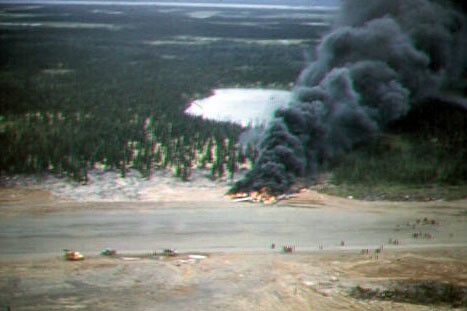 The Aircraft crashed & burned at a Northern Airport. There were no casualties in that crash. Of course back when Mr Tibbo did his article, access to Internet resources was rather sketchy. So the following text hopes to put both the visit and the Accident in a larger context and to add a few more details. The visit of the RAF 35 Squadron was part of a Goodwill Tour to the US. This had been organised apparently via discussions in February 1946 between General Ira Eaker who commanded the US 8th Air Force & Air Marshall Sir Norman Bottomley of the RAF Bomber Command. Group Captain Richard Collard was given charge of the Operation which would involve 16 Lancasters of 35 Squadron, plus an Avro York C Mk 1 (based on the Lancaster but modified for the Ground Crew & Spares Cargo). One Half of the Squadron left England (RAF Graveley) on 8 July with the other Half leaving on 9 July, following the route St Mawgan – Azores – Gander. 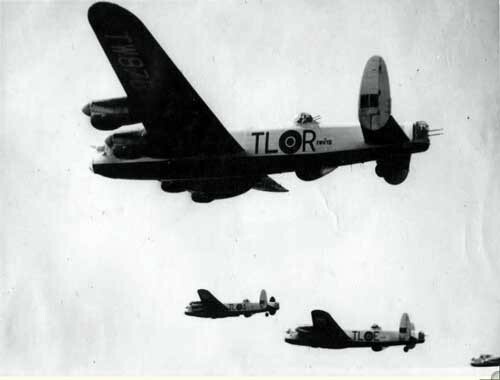 When the Lancasters arrived in Gander from the Azores, and got sorted out, they went, as one Crew member reportedly said, “to an enormous Breakfast at 03.30hrs. First un-rationed food since 1939, and we all made Pigs of ourselves”. After a stop of several days in Gander, the Squadron flew on to Mitchel Field, New York, and subsequently Toured as far as Long Beach & San Francisco in California. This part of the trip was basically without incident. During the Return Trip, the Lancasters departed Mitchel Field, NY, on the 22nd August for Gander. On the 23rd August, one half of the Squadron, ‘A’ Flight, departed Gander routinely for Lagens Field in the Azores. The British negotiated for the use of the Azores through a 570-year-old Treaty: the Treaty of Windsor (1373). Under an Agreement signed on 17th August 1943, Prime Minister Salazar agreed to the British request for Azorean Basing Rights “in the name of the Alliance that had existed between Portugal & Great Britain.” The British were given use of the Azorean Ports of Horta on the Island of Faial, & Ponta Delgada on Sao Miguel, in addition to Airfields on Terceira & Sao Miguel Islands. In the evening of 25th of August 1946, it was the turn of ‘B’ Flight to Take-off from Gander for the Trip to Lagens. Lancaster TL-R TW870, piloted by F/L Pete Stockwell, had to return to Gander after 20mins due to problems with his D R Compass. He may also have had a problem with his landing lights, which might otherwise have warned of his imminent arrival. He was cleared to land but mistook 2 Directional Green Lights which marked the end of the Runway for Glide Path Indicators. As a result, the Aircraft bounced on the raised Road which was parallel to and 20 yards from the edge of the Runway. There were some Civilians standing in that Area. The Aircraft’s Starboard wheel hit some of them, killing 3 men, 1 woman and injuring a 5th man. Given that an Aircraft Wheel is not all that wide. but it does have a substantial Undercarriage and given certain Reports, it may be possible that some dismembered bodies were in fact hit by whirling Propellor(s). Apparently, the Official evaluation mentions the Starboard Inner Propellor from which trailing Nacelle the wheel was lowered but it is possible that the Public Version was ‘Sanitised’, so to speak. The Map below from that era indicates approximately where the accident happened. 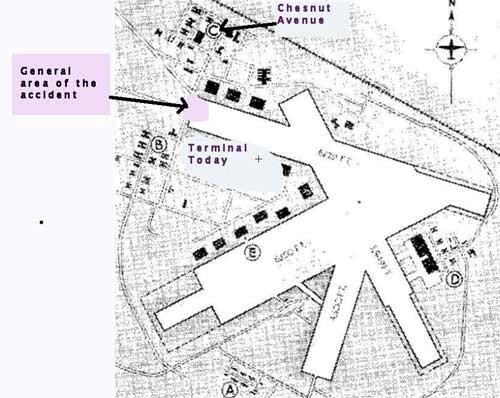 As a guide, the location of the present Terminal is indicated. Another way to physically find the Area of the Accident is to go to the corner of the Road to the present Terminal and the Radar Station. From that point, look North across the Runway and that should be it. On investigation, The pilot F/L Stockwell was exonerated of all blame. It is hard to define him but he is here in a photo of F/L Pete Stockwell doing an Engine Run-up on 6 June 1946 in the days before the start of the Goodwill Tour. It remained virtually Derelict – and often Cannibalised – in Hanger 8 until October 1950 when it was sold for Scrap to Hercules Sales of Toronto, then to Freight Lift Inc. The Aircraft was repaired just sufficiently to be flown from Gander to Dorval via Summerside. In Dorval it was converted to a Fuel Tanker. This included including the fitting of a Nose Cone that had once been part of a Trans-Canada Airlines Lancaster X or Lancastrian Passenger Aircraft – this Nose Cone had even been previously used as a chicken coup! After Transfer in 1952 to World Wide Aviation (owned by a Ferry Command legend, Don MacVicar), it was registered as CF-GBA and moved to Seven Islands, Quebec. There it was used primarily to resupply Outposts of the Iron Ore Company of Canada. On one of these Flights, on 28th July 1953. the Pilot, Capt A R Iba, lost control while landing in a crosswind on the gravel Airstrip at Menihek, NL, about 100Kms North-West of the Smallwood Reservoir. The Lancaster hit a rockpile, caught fire and was a total loss. The manifest showed an overloaded Aircraft of 2,150 gallons of Diesel, 300 gallons of Petrol & 800 gallons of Avgas. Happily, both Crew members were unhurt. The above photo shows the Lancaster TW870 / TL-R / CF-GBA as it burns on the edge of the landing strip in Menihek. It was taken by an unknown person, quite likely a Bush Pilot. Any identification of the photographer and other pertinent information would, of course, be appreciated. Researched and contributed by R G Pelley from his personal Historical Aviation Collections.